Welcome to another Fenway’s Future. This week we look at the surges of Deven Marrero and Carlos Asuaje, as well as the plight of Manuel Margot and Teddy Stankiewicz and Rafael Devers’ ever-increasing strikeout rate. Marrero’s ascension to the big leagues was faster than most expected given his low offensive production in Triple-A and the occupied infield spots on the major league club. However, injuries to the likes of Dustin Pedroia and Brock Holt have provided him with multiple call-ups to the Red Sox, even if he’s been limited to seven plate appearances and a pair of pinch-running situations. He’s yet to do much with those opportunities, but the 2012 first round pick is at least making his case for a longer major-league stint when the roster expands in September. Marrero has never projected to be an outstanding hitter, sporting a fringe-average hit tool, so his .244 true average in Triple-A this season isn’t of real concern. However, the 24-year-old has been hot since rejoining the PawSox Aug. 12, batting .307 (16-for-52) over the last 12 games. He’s recorded a base hit in all but one game since being sent back down. Although it’s a small sample size, and only one of those hits – a home run on Sunday – has gone for extra bases, Marrero’s production should help him further his case for a return to Boston come September. Of course, the true value of Marrero lies in his glove. He’s a plus defender with a strong arm and elite athleticism, making him capable of playing anywhere in the infield. If the Red Sox are smart, Pedroia will barely, if at all, see the field for the rest of the season, and playing Josh Rutledge every day serves no long-term purpose. That should at least open some opportunities for Marrero to play second base. And, of course, any excuse to bench Pablo Sandoval and start someone else at third is a good one. Add in some offensive production on Marrero’s part and his overall value expands. Jorge Marban’s journey to Triple-A has been a lengthy one. The 26-year-old righty flamed out in 2011 after two miserable seasons in the Rangers organization, and has since seen his baseball career take him through three years in the independent leagues before landing in the Australian Baseball League at 25 years old. He sported a 2.12 ERA and 11.65 K/9 in 24 appearances in Australia before being signed by Red Sox scout Steve Fish, who also managed Marban’s ABL team last November. Since then Marban has rapidly risen through the Sox’s system and is well on his way to earning a shot at the majors in the coming years. He started this season in High-A Salem, but has since worked his way up to Pawtucket after just 32 appearances combined in Salem and Portland, pitching exclusively out of the bullpen. He posted a 1.36 ERA, 3.76 FIP and 7.09 K/9 in Double-A before being called up and making his Triple-A debut Aug. 14. The results have been encouraging for Marban through three appearances in Pawtucket. He’s allowed just one run over 6.1 innings, striking out nine batters. This isn’t to say Marban is a sure thing, of course. He’s not the savior of Boston’s dreadful bullpen. Although he has his strengths – he mixes a nasty splitter with a mid-90s fastball that creates swings and misses at an impressive rate – Marban’s command is still a concern. He posted a 6.00 BB/9 in Portland and has already totaled three walks in his brief Triple-A stint. He also possesses a slider that needs work. However, considering how long it’s taken Marban just to get to this point, the fact that he’s ascended this quickly and is making a name for himself is encouraging enough for this season. 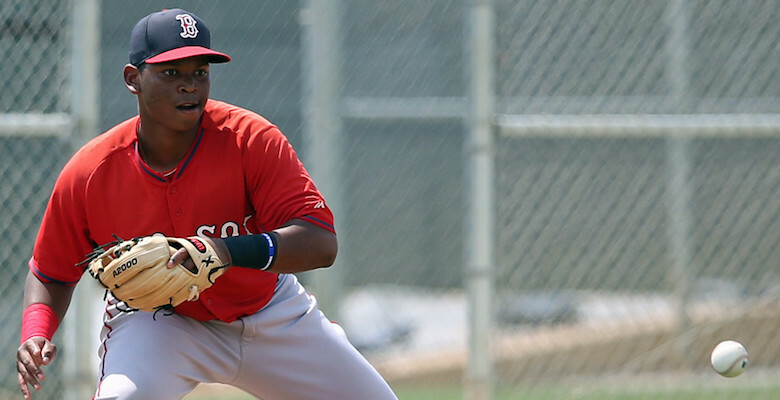 Manuel Margot entered the season as the Red Sox’s third-ranked prospect by Baseball Prospectus. Given his natural bat-to-ball ability, his power potential and his speed and athleticism, it was a well-deserved recognition. He lived up to that hype with a solid stint in High-A Salem, sporting a .271 TAv, .339 wOBA and 113 wRC+ in 46 games before being promoted to Double-A Portland in late June at just 20 years old. Double-A, however, has been a struggle for the outfielder, especially over the past month. Margot is hitting .241 (14-for-58) in August, dropping his TAv to .250 in Portland. At this point, it’s natural to question whether or not he was ready to be promoted. Given Margot is only 20, there is certainly no need to rush him through the system. He’s had a difficult time adjusting to Double-A pitching, and his strikeout rate (14.7 percent) is the highest it’s been at any level since his summer with short-season Lowell two years ago. Margot excels with a fluid swing and an excellent approach. It’d be crazy not to expect his plus offensive tools to lead to results at the Double-A level. One thing hurting him, however, is his aggressiveness early in counts. That’ll catch up to him as he faces better pitching with each promotion, which is evident in the ballooning strikeout rate and the weak contact he’s generating in Portland. These flaws, and his poor numbers in Double-A overall, aren’t to say this season has been bad overall. He’s already totaled 36 stolen bases and 34 extra-base hits for the year. However, his path to the major leagues, particularly as a mainstay, may take more time than the late 2016 ETA that some had projected before the season. Yes, we just highlighted Carlos Asuaje in last week’s prospect update. But at that time he wasn’t riding a nine-game hitting streak. He’s collected multiple hits in four of those nine games, including a four-hit effort last Wednesday. Asuaje’s numbers haven’t been particularly impressive in his first full season in Double-A, as he owns a .268 TAv and .340 wOBA in 2015. But they’re not bad for a player who projects to be nothing more than a utility player if he can reach the big leagues. Asuaje has primarily played second base this season, but he’s also seen time at third and left field. That versatility alone gives him value to an organization. Offensively he’s shown average hit potential with below-average power, but he’s good at finding the gaps for extra bases. In fact, he leads the Eastern League with seven triples this season and is also in the top half of the league with 22 doubles. His approach and knowledge of the strike zone are also positives. Teddy Stankiewicz appeared to be turning a corner. After a dreadful first three months that saw him get hit hard on numerous occasions, the righty finally started finding consistent success on the mound this season, tossing a pair of shutouts over a four-start stretch in which he struck out at least three hitters per outing. Stankiewicz was back to his early season ways on Friday, however, allowing seven runs over 4.2 innings in what was arguably his worst start of the season. He seemed to struggle with his control in particular, walking one batter, hitting another and throwing two wild pitches. Although he’s been better overall, Stankiewicz is letting pitches get away from him, as he’s hit four batters over his last three starts. That inability to find the strike zone is surprising given his command – he owns a 1.75 BB/9 this season – has been one of his strengths throughout his career. Friday’s letdown upped his FIP to 4.03 for the season. Every bad outing from Stankiewicz is notable given his failings this season. However, that shouldn’t discount the way he’s improved since mid-July. He was at his best at this time last season in Low-A Greenville and at 21 has plenty of time to develop. Let’s also not forget he came into this season with a whole new delivery, which would naturally lead to a learning curve. Perhaps his next start, which will be one of his final of the season, will be a better indicator of whether it was just a bad start amidst a string of good ones, or a sign that poor outings are still a habit. Regardless, what continues to make Stankiewicz valuable is his ability to eat innings. The righty is eighth in the Carolina League in innings pitched (123.1) and has made at least one fewer start than four of the seven hurlers in front of him. Imagine what those numbers could look like if those innings become more productive. Rafael Devers is like the film Titanic. It’s nearly impossible to find a bad thing written or said about either of the two. Devers has garnered James Cameron’s film-esque praise throughout this season. Heck, he’s received plenty of attention on this site alone. Devers has earned it, of course, but we’re not here today to spend too much time drooling over his plus hit tools and 30 home run potential (although those have been pretty impressive so far). Since I’m in charge of the next paragraph and I’m no fun, we’re going to be a little picky (I promise, just a little). The one thing that’s been concerning about Devers’ approach lately has been his rising strikeout rate. Although a 17.5 percent K% isn’t terrible for an 18-year-old with plus bat speed and solid mechanics for his age, it’s worth noting this number has gotten progressively worse, whether it be due to a naturally aggressive approach or pitchers finding new ways to attack him. He held a 15.8 percent mark before the All-Star break. He’s struck out at a 23.7 percent rate since Aug. 1. Should we be alarmed by such drastic spike? I wasn’t sure at first, so I decided to compare it to a player he’s drawn multiple similarities to: Robinson Cano. Cano played a single season of Low-A ball for Greensboro in the South Atlantic League at 19 years old in 2002. His slash line that season (.276/.321/.445) was notably similar to Devers’ 2015 marks so far (.275/.318/.433), but Cano struck out at a less eyebrow-raising 15.3 percent rate that season. So is Devers’ rise in strikeouts a concern? Yes, primarily because that has the potential to only get worse if he’s promoted to High-A next season – unless he can improve his approach. 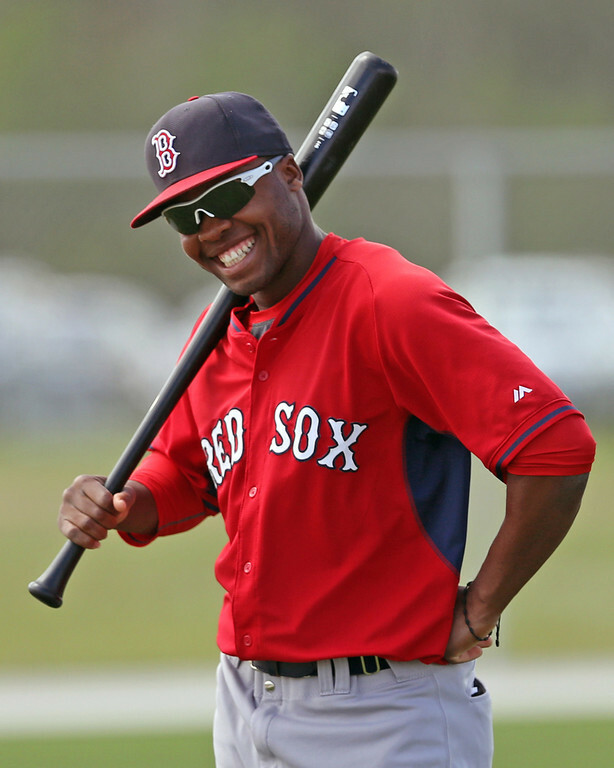 However, if you’re still hoping for Devers to become the next Cano, there’s still plenty of reason for optimism. Nick Canelas is a contributor at BP Boston.